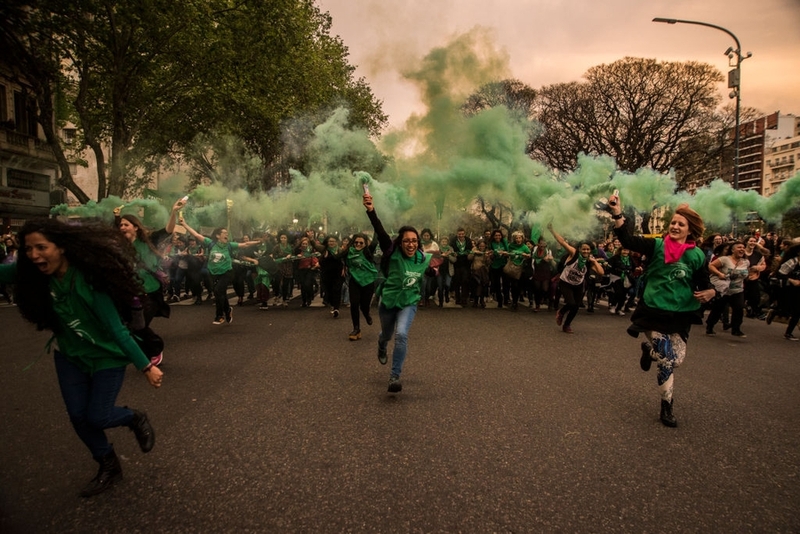 Several protests took place in Argentina in recent weeks, in the context of legislation discussed in the House of Representatives which sought to decriminalise the voluntary interruption of a pregnancy during the first 14 weeks. For months, thousands of people took to the streets with green scarves, the colour of the campaign for legal, safe and free abortion. On 13th June 2018, the day of the final vote, protesters from both sides gathered in their thousands outside Congress in Buenos Aires waiting for the results. After almost 22 hours of debate, Congress finally approved the legislation, "in a historic victory for the country’s growing women’s movement." Following this decision, the Senate will debate the law's final approval on 8th August 2018. The mobilisation saw the participation of diverse sectors of civil society including social movements, feminist collectives, political parties, high school students, families, Catholic groups and trade unions. In one example, several high school student groups held occupations of their institutions in support of the bill. In a separate development, on 22nd May 2018 after a month-long struggle by Buenos Aires metro workers, security officers broke the strike by force. According to the Asociación Gremial de Trabajadores del Subterráneo y Premetro, (Association of Subway Workers and Premetro, AGTSP) 16 workers were arrested. After what they claimed was "brutal repression" of their protest, the AGTSP called for an indefinite, city-wide transit strike until their fellow workers are released from jail. In the south of Argentina, civil society demonstrated against the construction of two mega hydroelectric power plants on the Santa Cruz River in Argentine Patagonia, where Chinese companies are investing around five billion dollars. As reported recently by the organisation Environment and Natural Resources Foundation (FARN), China "has mainly been financing hydroelectric, nuclear and hydrocarbon projects and only 4% of these investments are in renewable energies, which is precisely the sector where the country is lagging". Environmental organisations are particularly critical of the dams on the Santa Cruz River, which begins in the Glaciares National Park and could affect the water level in Lake Argentino, home to the Perito Moreno Glacier, one of the country’s major tourist attractions. Despite concerns about environmental impacts, the government of Mauricio Macri decided to go ahead with the projects. Argentina se unió para pedir la despenalización del aborto, pues los abortos clandestinos son una de las principales causas de muerte en el país. On 26th May 2018, Roque Azcurraire, a photographer with the community news website La Garganta Poderosa, was attacked and arbitrarily detained by a special unit of the federal police in Buenos Aires while the police unit was performing an operation. According to Reporters Without Borders, during the operation federal agents "tried to intimidate minors who were due to be questioned as witnesses in an investigation into a case of alleged torture in May 2016, in which six members of the federal police are implicated". Reports indicate that the police broke into the journalist's home, physically attacked him, confiscated his equipment, and then took him and his brother-in-law to the police station. They were released two days later. In a separate incident, the Argentinian human rights' organisation Centro de Estudios Legales y Sociales, (Legal and Social Studies Centre, CELS) requested the Commission for the Protection of Competition to reject the merger of communication service providers Cablevisión and Telecom. CELS stated that the potential merger of the two corporations will deepen media concentration in the country and will put freedom of expression and access to information at risk in Argentina. As reported previously in the Monitor, when President Mauricio Macri took office in December 2015 he immediately issued an emergency decree removing the cap on the number of media outlets one company can control. The new president also merged two regulatory bodies in a new entity housed in the Communications Ministry. Civil society criticised both measures as infringing on freedom of expression.